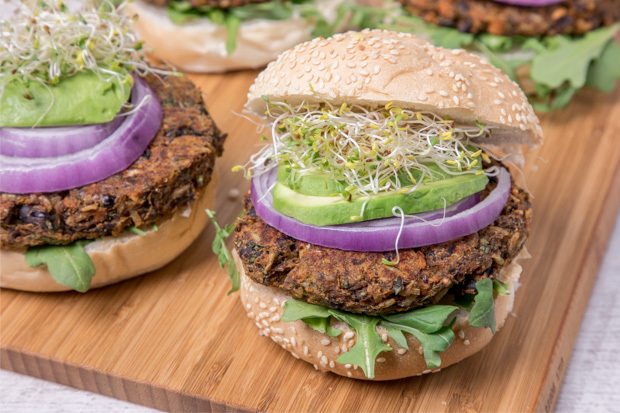 Made with black beans, rice and sweet potato, this flavourful flax burger is both delicious and nutritious. Preheat the oven to 400 ºF (200 ºC). Line a baking sheet with foil. Carefully cut the sweet potato in half and brush the cut sides with canola oil. Sprinkle with salt and pepper. Place cut side down on the baking sheet and roast until tender, about 40-50 minutes, depending on the size of your sweet potato. Let cool, then scoop out the flesh. You need 2 cups (500 mL) of mashed sweet potato for this recipe. Turn the heat of the oven down to 375 ºF (190 ºC). In large mixing bowl, add black beans and roughly mash them. Add the sweet potato and lightly mash into the beans. Stir in the cooked brown rice, ground flaxseed, green onions, cilantro, garlic, spices, brown sugar and salt. Mix to combine. The mixture should be moist yet moldable. Taste and adjust seasoning. Line a baking sheet with parchment paper. Using a 1/2 cup (125 mL) measure, scoop the burgers out and place on the baking sheet. Gently press down. Brush the tops with some of the canola oil. Bake for 20 minutes, then carefully flip, brush the tops with the remaining canola oil and bake for another 20-25 minutes until the burgers are firm. Remove from the oven. If serving with cheddar, place some shredded cheddar on top of each burger during the last 5 minutes of cooking time. Assemble the burgers as you like, and eat immediately. Leftover burgers can be stored in an airtight container and gently reheated the next day.